One of the world's leading fashion designers, Roberto Cavalli is known around the world for his ability to bring together both ostentatious styles and wearable fashions. The Italian designer was also the first person to bring out sand blasted jeans to the public. Born in Florence in 1940, Cavalli found an early love for fashion and art and in his first foray into the business he studied at the local art institute, focusing on textile prints. Cavalli is also well-known in fashion circles for inventing a method of printing and patching different fabrics together. After showing off the new technique, Cavalli was offered work with some of the world's leading fashion houses including Hermes and Pierre Cardin. Today, Roberto Cavalli's clothes is sold in more than 50 countries around the world and his collection is composed of everything from women's wear, men's fashions and even a wide range of accessories. 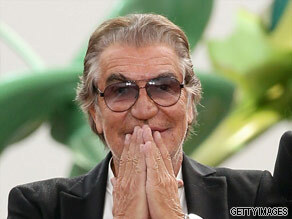 Here's your chance to send in your questions to fashion designer Roberto Cavalli. Do you want to know about the state of fashion today? How has things changed since he first started in the business? Does he have a favorite collection he will always remember? What's his biggest accomplishment? Please leave your questions for Cavalli below and be sure to include where you're writing from. Questions directly to Mr. Cavalli himself? This is something to take advantage of! Any secret to a nice, thick head of hair like you have? Am very envious! Do you have a fashion nemesis or someone you feel you've been competing against for most of your career in fashion? –	How will you Improve Quick Dry for men’s suits in order that men do Not have to change suits when their clothes get wet by Rain or Snow? I am awaiting Roberto Cavalli’s replies. Why do some of us love fashion and presenting ourselves well whilst others find it nonsensical or irrelevant? If we are deep about meaningful things in life why can we not care about fashion as well (as far as others are concerned?) Why do Italians do fashion so much better than anyone else? Will you ever open a store in Nigeria? Will you be taking any new interns this year because I would love to intern for you. What does it feel like to see your creations come to life? Please could you give 2 names of people from history (not necessarily connected to fashion), who you would love to dress today with your designs and what would you dress them in? Eg. Marilyn Monroe and Shah of Iran's wife – Farahdiba. You are one of my biggest fashion idols. What is the key secret(s) to being so successful? What is your favorite success story? Thank you so much! What is your opinion about Lady Gaga's meat dress at the VMAs? Robert–Love your clothes–Keep those lines cmin out!! Before the Empire Period, men wore clothing and adornments that were just as elaborately styled as women's attire. With a generation of males that embrace burnout fabrics, skinny pants, accessories such as smart phones, and in turn attention, do you believe men will once again triumph the fashion industry? Thank you for your time. I'd like to ask Mr. Cavalli, is there a difference (styles, designs, etc) between Fashion Week in the US vs Fashion Week in Europe? If so, what are the main differences? what is his own success secret? what can he recommend young business people about being successful at work? I would like to ask Roberto Cavalli why he continues to use fur and exotic skins in his collections, when he knows the cruelty involved. It takes up to 50 animals to make one fur coat and these animals are often skinned alive, anally electrocuted and beaten to death.